With Halloween fast approaching the amount of pumpkin recipes has grown three fold in my news and blog feeds. As Halloween is not that big here in Australia I've never really had too much to do with baking with pumpkin, with the only recipe I really know being Pumpkin fritters (a South African sweet pikelet that you toss in cinnamon and sugar). All this pumpkin cheer made me want to try some pumpkin baking for myself. 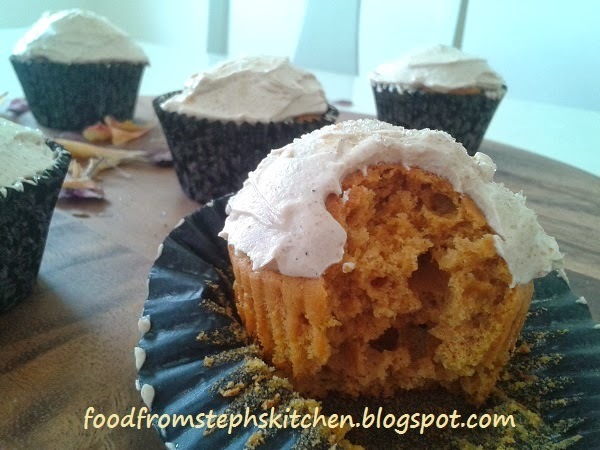 Browsing through my recipe book I decided to adapt an old banana bread recipe to create these pumpkin and white chocolate cupcakes with a cinnamon cream cheese icing. Before you forget - preheat your fan forced oven to 180 C or 390 F.
In a mix master or with electric beaters cream the butter and brown sugar. Add the eggs and beat until the mixture is smooth and thick. Next add the pumpkin, spices and food colouring, mixing through until the pumpkin and food colouring is evenly through the mixture. You might be wondering why I add the food colouring; it's to enhance the orange colour of the pumpkin. You could really add any colouring you like, such as green to make the mixture bright green or black for something a bit more spooky. Gradually add the flour, followed by the salt and bi-carb. The mixture might look a little thick but you still need to add the melted chocolate. Melt the white chocolate and add to the mixture while its still hot. You can melt chocolate in the microwave but I think it's always better doing it the old fashioned way in a bowl over a pot of simmering water. If you're not sure how to do it, here's is a great little video on how to melt chocolate on the stove. Fold the white chocolate through your mixture until it's mixed completely through. Set up your cupcake cases in a cupcake tray and fill them half way with the mixture. I find the best way to fill cupcake cases is using two spoons (a soup spoon and a dessert spoon). Take a spoon of mixture on your soup spoon and push it into the case using the dessert spoon. My Mum taught me this clever treat so that you don't make a mess all over the sides of the cases trying to get the mixture in. 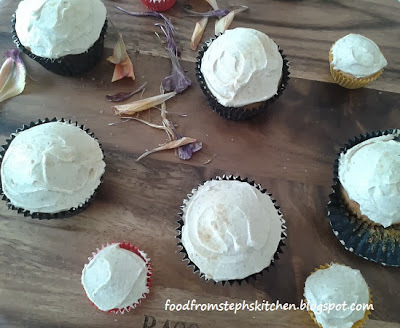 If you are using mini cupcake cases use the same technique but with teaspoons. Bake in the oven for 20mins (10mins for the mini cupcakes). Once cooked through turn the cupcakes out onto a cooling rack and get started on the icing. Blend the cream cheese in a food processor until smooth. Next add the icing sugar, vanilla extract and cinnamon. Blend again until all the ingredients are well combined. 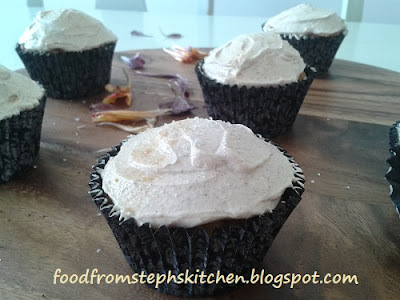 Once the cupcakes are cool spread the icing on top, sprinkling with a little vanilla sugar or icing sugar.